$14.95 PRINT. 32 pages. $6.25 E-VERSIONS. 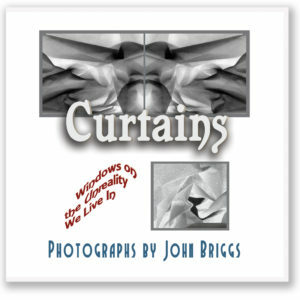 Curtains is a quick, dizzying photographic journey into the hidden realities lurking in the folds of puddled curtains that the photographer, John Briggs, found in windows of a central London office building. The photographer puts the curtain folds though simple transformations that result in strange creatures and eerie landscapes that suggest to him that everyday reality might be unreal. The book includes an introduction in which Briggs, who has a Ph.D. in aesthetics, briefly discusses the nature of photography as abstract art. In October of 2013 Briggs and his wife were walking near Westminster in London, and the curtains hanging in the windows of the Old British Admiralty building caught his eye. For him the cascading and rippling folds of these curtains exuded a “sumptuous, classically sensual feel.” He photographed them until a policeman asked him to stop taking pictures of a government building. When he got the photos home and examined them on his computer, Briggs was disappointed that the “glowing, gauzy folds” he had seen in the man-made fabric of the curtains now seemed more harsh than sensuous. He tried some digital techniques to draw out the curtains’ sumptuous appearance once again, but it was not until 2015 when he experimented with solarization, inversion, and other techniques that he was able to find ways to reveal to us what he had seen on that October day. In this slim volume we are shown both the “normal views” of the curtains and the images in which the application of these techniques brought out true complexity and strangeness. John Briggs is a Café Irreal contributor and author of Fractals: The Patterns of Chaos among other works, so we share with him an appreciation of the times our normal concept of reality is undermined. Impressed with the strangeness these photos convey, I carried Curtains with me to Prague and spent some time looking at it. Then last week while in London on our way back home, Greg and I made a special detour to the Old British Admiralty to see for ourselves the “puddled” curtains Briggs photographed. After our visit to the Admiralty, I appreciated the images in Curtains even more. Though I often photograph architectural details and rich textures and I seek to convey in my own images the above-mentioned “glimmers of irreality,” I wouldn’t really have given the Admiralty curtains a second glance. The fact that Briggs chose to photograph them and then made his photos yield two dozen mysterious and complex images is a project that impresses me with its deceptive simplicity. In Being and Nothingness Sartre described being-in-itself – the objects we encounter in the external world – as a plenitude of being, full of itself, and manifesting itself in an infinite number of aspects. When we really look at a physical object and are able to see, in Briggs’ words, “what’s hidden in plain sight all around us,” we begin to appreciate the true complexity of the in-itself. Briggs’ photos are beautiful works in their own right, but they also teach us how to stumble into strangeness and to find the “whimsical and profound” in the everyday.